Maurice Sykes, director of the Early Childhood Leadership Institute at the University of the District of Columbia's National Center for Urban Education, has spent his career advancing high-quality early childhood education and advocating for educational reform and teacher professional development. Maurice formerly served in the District of Columbia Public School System as deputy superintendent for the Center for Systemic Educational Change and director of Early Childhood Programs. Sykes has also advised the US Department of Education on educational policy and programs related to urban school improvement. 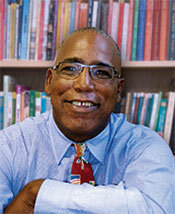 Sykes has served as teacher, teacher trainer, and curriculum developer. He has also directed the Education Policy Fellowship Program at the Institute for Educational Leadership where he trained mid-career leaders. He was profiled as an Early Childhood Champion in a national study released in 1997 by the National Association of State Boards of Education and in 1999 was elected to the Governing Board of the National Association for the Education of Young Children (NAEYC). Maurice has written for numerous publications and has traveled nationwide inspiring and challenging schools and communities to do the right thing for children. This book provides a clear framework and a systematic approach to help you become a more capable, competent, and effective leader as you serve young children and work with your colleagues. 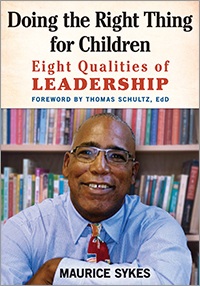 In Doing the Right Thing for Children, author Maurice Sykes presents eight core leadership values—human potential, knowledge, social justice, competence, fun and enjoyment, personal renewal, perseverance, and courage—and shares stories to inspire and challenge you to be more intentional in your work. Reading this book serves as a reminder of the critical need to develop the skills, knowledge, and habits of mind of leadership at the organizational, individual, and classroom levels.